A ‘Schedule Now’ feature to allow customers to request dates and times for service. A link to our company website. A list of our qualifications (Bryant Factory Authorized Dealer, NATE, Bryant Ductless Systems, Bryant Indoor Air Quality Specialist, Cor Home Automation). A link to our company reviews on Facebook, Google and the Bryant website. Along the top bar of the website, enter the zip code 19003 in the ‘Find a Dealer’ box. 3. 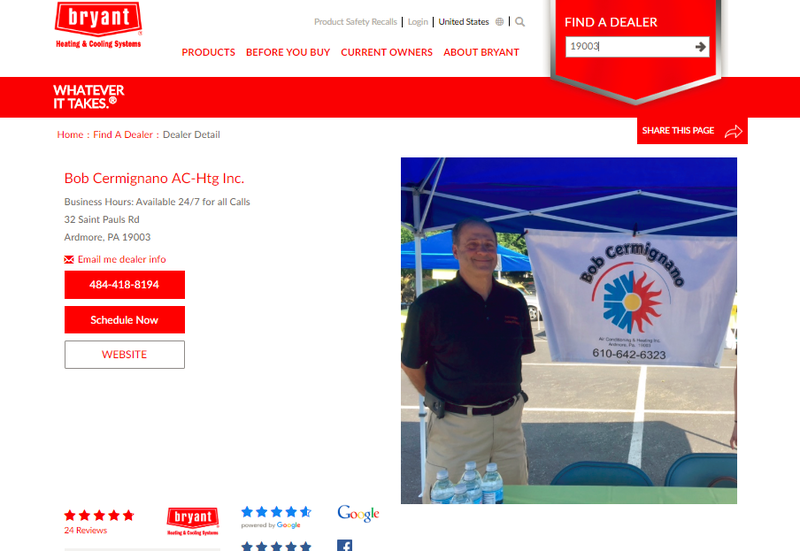 Search for ‘Bob Cermignano AC-Htg Inc.’. 4. Click on our company name to view our profile.